I’ve learned a few things running the Boston Marathon. I’ve learned that training for the Marathon is really hard. I’ve also learned that, if you can run a marathon, you’ve proven only that you're stubborn enough and have sufficiently functional knees to run for a while without quitting. But if, like my patient partner, John Kenney, you've suffered debilitating seizures for your entire 13 year lifetime and still look at life as a joyful challenge without an ounce of self-pity, you probably can do almost anything. As some of you know, John was born with a rare disease called Sturge-Weber Syndrome. John’s parents were told when he was born that he would not live beyond the age of 2. Shortly after receiving that prognosis, his parents took him to Boston Children’s where he has since been periodically treated. He is now 13, and a most incredible young man. It’s one thing to fall as we all have, and get ourselves back up; it’s another to be felled as a child without warning by seizures over which one has no control and have the strength, courage, and pride to get up and, with a smile, fight on. That’s John. I don’t know if people are born with a purpose, or if they just somehow create their own, but John in his young life has already taught more people about hope, grace, and strength of character than most of us will ever have. So, after John said that he would stay on another year as my patient partner, I decided to run the Boston Marathon one last time for the kids of Boston Children’s Hospital as a member of the Credit Unions Kids at Heart. 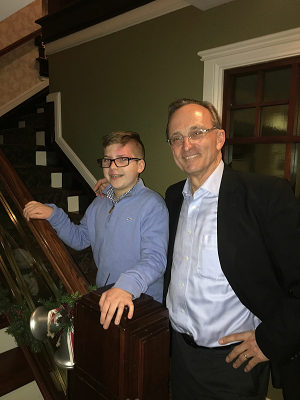 I was fortunate last year to talk with the surgeon at Children’s who has saved many a child's life, and he spoke of how instrumental the Kids have been in funding research at the Hospital into diseases -- such as Sturge-Weber syndrome -- of which the medical community is only marginally aware. The money that the Kids raise gets that research off the ground. Once the research is initiated and shows signs of success, other funding sources become available, and near miracle advances in curing or correcting childhood disabilities can be, and are, developed. The work is expensive, but the results are available to all kids, regardless of ability to pay. Our world has a lot of problems, but with your support, we can make some small steps to big solutions for some kids who deserve a chance. I’m asking you to join in this effort to do amazing things one last time. I don't know how much longer I'll be able to put one foot in front of another, but whether anything comes of this last effort to do it for the young and vulnerable depends upon what you do. Please, if you can, donate today. To donate in honor of this runner, please call the CU Kids at Heart coordinator at 800.428.1144, Ext. 3320, or mail a check to: CU Kids at Heart, 35 Corporate Drive, Suite 300, Burlington, MA 01803. Please make checks payable to “CU Kids at Heart” and add the name(s) of the runner(s) in the check’s subject line. Copyright © 2019, Credit Unions Kids @ Heart®, All Rights Reserved.